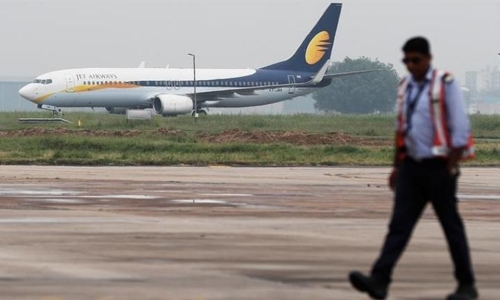 India’s Jet Airways has grounded four planes after failing to pay lessors, the airline said, in the latest evidence of financial distress at the debt-laden carrier. The airline -- India’s second-largest by market share -- is buckling under the weight of debts worth $1.1 billion and is urgently seeking funds to continue flying. The Mumbai-based carrier has been badly hit by fluctuating global crude prices, a weak rupee and fierce competition from budget rivals which has sparked price wars. Millions of dollars have been wiped off its market capitalisation over the past year. “Four aircraft have been grounded due to non-payment of amounts outstanding to lessors under lease agreements,” the carrier said in a statement to the Bombay Stock Exchange late Thursday. “The company is actively engaged with all its aircraft lessors and regularly provides them with updates on efforts undertaken by the company to improve its liquidity,” it added. Jet Airways first hit turbulence in August when it failed to report its quarterly earnings or pay its staff, including pilots, on time. Chief executive Vinay Dube later reported a loss of $178 million for July-September and announced a cost-cutting programme amounting to 20 billion rupees ($280 million) over the next two years. In January the airline admitted it had failed to meet debt payments to banks as it seeks investment to help turn around its fortunes.